Is an enclosed space, as the name indicates (from the French “Clos” – enclosed” and “lieu” – space”), designed especially for the painting play. Closlieu is the home of Formulation. In this space people paint to satisfy the inner need not to create art. It is a safe environment, protected from judgments and competition. Closlieu was discovered by Arno Stern over 60 years ago, during his supervision times in the war orphanage. The design of the place came naturally to him, as he observed people’s raw needs in the painting play. It has four walls which are used to stick plain white sheets on and paint on. In the middle of the room there is an 18 color palette table, each color having its brushes. This is the meeting point for all participants within the room and the palette has to be shared with the others. The work in Closlieu is however individual. Everyone chooses his own space, and each paints on their own paper, the paper on the wall is the personal space which is not meant to be shared with the rest of the group. Diversity is key in the development of the individual. In a Closlieu there are no age groups, or restrictions, there are no evaluation criteria, there is no right or wrong. Everyone creates at their own pace, without being questioned or asked to explain themselves. 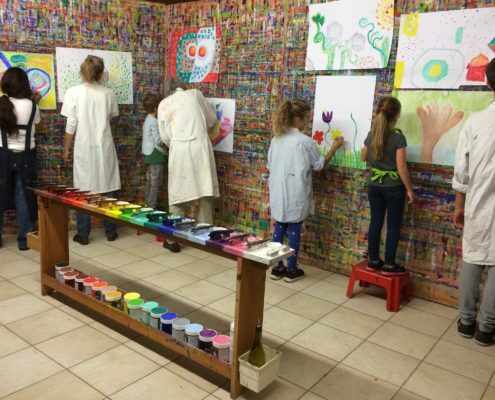 The activity which arises in this place is called painting play. All the elements in the room (palette table, brushes, pins, papers, stools, rules, participants, practitioner…) are part of the game. 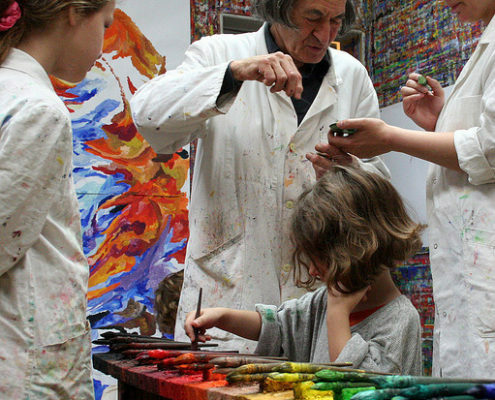 What on the surface seems to be a simple painting play, in fact stimulates and helps develop skills that go above and beyond traditional learning techniques. Indulging in the painting play, you will discover and learn to appreciate your uniqueness. Closlieu is not a place where people come to escape reality. That is why the timetable restricts the workshop to only once a week.